Aliplast is a leading and recognized on the market designer, manufacturer and distributor of architectural aluminum systems for the construction industry. The company was founded in 2002 with the participation of the Belgian Aliplast Aluminum Systems based in Lokeren, Belgium. A wide range of Aliplast aluminum systems includes window and door systems (Imperial, Superial, IP800, SP800, Star, Econoline), facade (MC Wall, MC Passive, MC Glass), sliding (Ultraglide, Slide Plus, Slide Cold, Ecoslide), bifolding (Panorama) and roofing and winter garden systems (Aliver 2000+, Victorian Plus). The highest quality of the offered product, logistics and distribution solutions, the latest technological solutions, and the ever-expanding offer of systems often adapted to individual architectural solutions, put Aliplast in the forefront of aluminum system manufacturers for the construction industry. Aluminum window and door systems come in two thermal variants: cold (Econoline) and warm (Imperial, Superial, Star). Cold systems are used to build internal partition walls and doors, while warm systems are used for external joinery. Insulated systems can be enriched with additional thermal inserts, thanks to which the structures obtain better thermal parameters. As one of UK’s leading manufacturers of high quality bifolds, Smart Systems elegant range of slide-folding doors is sure to impress for its versatility and customisation options. Smarts collection of Visofold bifolding doors are ideal for both domestic and commercial properties, creating maximum access between rooms and outdoor spaces. All Smarts bifolds are made to measure, fitting your spaces perfectly. Their vast range of bespoke options allow home and business owners to create a look ideal for their property. There’s an extensive range of colours and hardware to choose from as well as configuration options. The Smart Alitherm Heritage door is the ideal replacement for steel balcony doors on heritage applications such as building renovations or apartment conversions. The Alitherm Heritage door provides the solution for conservation areas where planning regulations require a like-for-like product replacement. Alitherm Heritage door profiles feature the system’s signature slim sightlines and elegant lines that complement Smart’s existing Alitherm Heritage window and mimic those of steel doors. 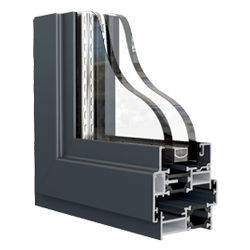 The system has all the advantages of modern aluminium profiles that feature polyamide thermal breaks, allowing the system to achieve a U Value of 1.5 W/m2k when installed with a suitable sealed unit. Profiles have a high quality powder coated paint finish at Smart’s state of the art paint facility in a choice of finishes, including single or dual colour, in a range of standard and non-standard colours. Visofold 6000’s flexibility also makes it suitable for commercial projects. Where large opening apertures are required, the system offers maximum light and space to give unimpeded views. This highly-versatile, easy-to-operate system is the perfect option for even the largest project. Capable of opening up an entire wall, yet presenting a contemporary, elegant glazed façade when closed. 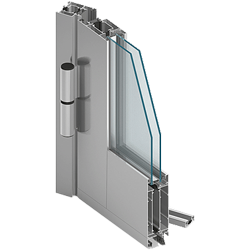 The system features a choice of internally or externally folding sashes, which when open, sit flush to the frame. Sashes are hung from a floating mullion and slide on a recessed bottom roller and top guide. This allows for ultra-slim profiles, smooth operation and robust security. Delivering the perfect combination of strength and performance, Visofold 6000 profiles feature a polyamide thermal break that enhances the system’s thermal performance. High quality PDM gaskets and weather brushes aid weather resistance. Aluprof aluminum systems enable the construction of many different types of windows and doors depending on the scope of application and detailed requirements for functionality, aesthetics, thermal insulation, burglary resistance, smoke tightness or fire resistance. They include both aluminum constructions without thermal insulation, used to build internal partition walls and doors (MB-45, MB-45 Office, MB-EXPO, MB-80 Office) or balconies (MB-23P system), as well as solutions based on thermally insulated profiles (MB-86, MB-60, MB-70, MB-59S). A significant part of thermally insulated systems is available in the “HI” version, characterized by special inserts in profiles that reduce the thermal conductivity. 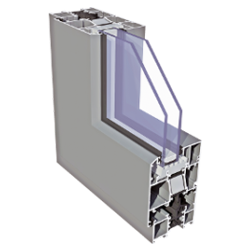 – windows with narrow aluminum profiles and characteristic shapes: MB-Ferroline and MB-Slimline. On the basis of many Aluprof systems, folding doors can be made (a separate proposal is the MB-86 Fold Line system), as well as anti-burglary and smoke exhaust windows. For recipients who want to reconcile the appropriate technical parameters with an affordable price, a whole range of economic solutions have been created, such as MB-45S, MB-59SE and MB-60E. A wide range of aluminum profile systems Aluprof is systematically developed to be able to best respond to the needs of modern architecture and meet the requirements of increasingly stringent standards and regulations.